Focaccia's light texture topped with a touch of olive oil and coarse salt provides a perfect side for nearly every meal. Filled with savory goodies, the plain dough it an empty palette just waiting to be adorned... Garlic, caramelized onions, fresh herbs or simply shredded Parmesan all come to mind. Our classic Herb Focaccia has been a staple for nearly 15 years, but when my husband pulled a batch of his home made (by him!) spaghetti sauce from the freezer last night, I wanted something a little more substantial. Short on time I combined 4 different recipes into an excellent flat bread that will enter our regular rotation. Sun-Dried Tomato Focaccia with Feta met my time requirements as a no-knead bread, though the rising time will still take about an hour. The addition of a handful of beautiful sun dried tomatoes and a few tablespoons of Trader Joe's Mediterranean Feta provided an entirely new layer of flavors to the garlic and herb base. Baked in a hot oven for about 20 minutes, the slightly crisp crust was drizzled with a garlic olive oil and a sprinkle of freshly grated Parmesan Cheese for the perfect savory/salty side to our sauce. In a large mixing bowl combine 1 cup of flour with the water and yeast. Stir until smooth and set aside for a few minutes while you are assembling the rest of your ingredients. Add the salt and olive oil and mix again. Add the garlic, tomatoes, feta and herbs, stir again. Add the flour in 1/2 cup measurements, stirring after each addition to combine until all the flour is incorporated. The dough will be a bit wet. If it is too wet to work, add a Tablespoon or two of flour, being careful not to add too much. Do not knead the dough. 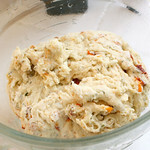 Place the dough in a greased mixing bowl and cover with plastic wrap. Put the dough in a warm area and let rise until dough has doubled, about 45 minutes. Punch down dough and pour out onto a well floured surface. Stretch the dough to about a 1 - 1½ inch thickness and carefully transfer to a prepared baking sheet (I simply sprinkle the sheet liberally with semolina flour). Preheat oven to 425º. Cover with a cloth and let rise 20- 30 minutes. Drizzle dough with additional olive oil (I like to use a garlic flavored oil!) and sprinkle with a few pinches of coarse salt. Bake for 10 minutes. Remove focaccia from oven and quickly sprinkle with Parmesan Cheese. Quickly return focaccia to the oven and bake for about 10 more minutes, or until golden brown all over and slightly crispy. Remove from oven and cool. May serve warm or cold. Wonderful dipped into an herb or garlic olive dipping oil! I never tire of foccacia and all it's possibilities! Love what you did with it here. aren't sun dried tomatoes the best?! This foccacia looks wonderful! I bet it is fabulous dipped in olive oil! I've haven't ever made focaccia. . . yet! Sun-dried tomatoes are a favorite at my house, and they do pair beautifully with feta cheese. Yours looks delicious! this looks great! and eggless which means I can try it!! can't wait. What a great flavor combination! 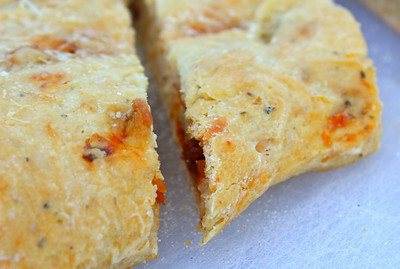 This is a focaccia that would not last long in our home! Simply delicious and I could make a meal out of it with a glass of wine! What a beautiful focaccia recipe! This would be wonderful dunked in soup, alongside a salad, or just by itself. Thank you for sharing. Some of my fav ingredients in here and always on the lookout for a new focaccia! Delicious! I saw this on foodgawker and saved it to my faves without even realizing it was from you, Kim. Love it and will definitely be making it. This focaccia looks so tasty. I love the sun-dried tomato and feta combo! This looks so fabulous! I adore sundried tomatoes in bread. Dipping in oil, even better. Thanks for sharing! Focaccia is one of my favorite breads. It is a perfect side and it is so addicting. I can probably eat and entire loaf--especially if I have something to dunk it in! 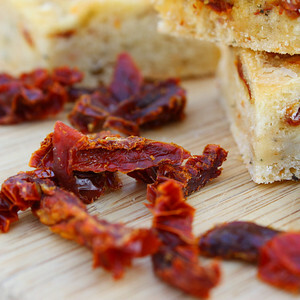 Feta and sun-dried tomato are a delicious combo...I'll have to try it out soon! 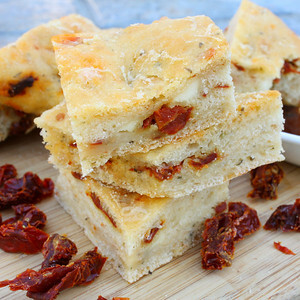 Your Focacia bread looks wonderful, especially with the feta and sun dried tomatoes. One of these days I must face my fear of yeast, and try this recipe. This recipe might be the one. the problem is that we would eat the whole thing, and my pants are getting tighter the way that it is. I wouldn't be able to stop eating that, it looks incredible! 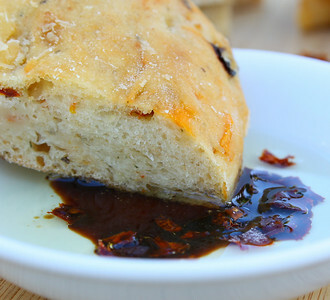 I really need to make some Focaccia bread, and soon. Looks wonderful. This looks fantastic! I love the feta and sundried combo.. Can't wait to try it. Quick question - do you think it'd be okay to make the dough the night before and let it sit in the fridge? And bake it the next day when ready to eat? Or can I just bake this the day before, and re-heat in the oven? I'm thinking in terms of a dinner I have, but can't really make it during the day as I'll be at work! Thanks in advance! Sabrina, I'm wondering if the texture of the focaccia might change if you make the dough earlier. I think I would recommend making the focaccia the day before and re-heating! We ate it for 3 days after making it, the next day was just fine, but after that it dries out a bit. It's a good one! Hope you like it too! Kim, New technology has evolved since posted, I'm pinning this one! Hi,can I use gluten free flour?